Our organization is involved in manufacturing and exporting Stair Case Straight (wood & metal) with Height Adjustable at a large scale. These products are made of high grade raw materials. 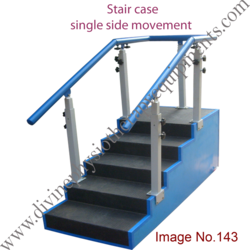 Adjustable height system, fine handle and the stair case with rubber coated for grip are features of this product. This type of product is widely used in hospitals and office auditoriums etc. We have a wider availability of this product at a diminutive price. We hold the expertise in manufacturing and exporting Staircase Corner Type (wood & metal) at an ample range. We manufacture these products using fine woods and metals. The effective grip for the steps and adjustable screws on the handle bars are the basic feature of this product. In addition the corner designed extension with same property gives an unique identity to this product. Modern hospitals use these stair cases widely. We offer this quality product at an industry leading price. 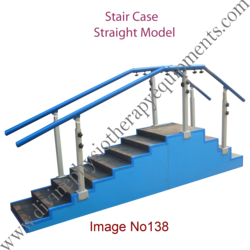 We at Jeevan Physiotherapy Equipments are engaged in manufacturing and exporting Staircase Single Side Steps (wood & metal) all over the world. Our range is manufactured using fine materials that are in compliance with international quality standards. It is designed perfectly to be placed on one side with height adjustable handle system and fine grip on the steps. These are easy to fix and widely used in small clinics. We trade this highly durable product at less expensive in price. 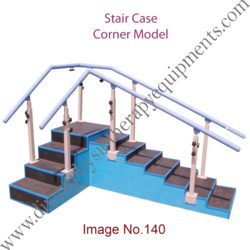 Since the initiation of our business, we have been successfully affianced in providing the best quality Stair Case for physiotherapy. 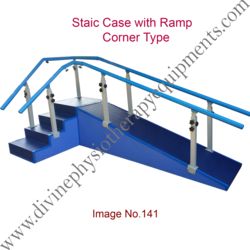 The offered stair case is specially used in various hospitals, physiotherapy centers etc. This stair case is manufactured by our deft professionals with the use of high grade raw materials with the aid of cutting-edge techniques. Known for its durability and quality, the offered stair case is offered at industry leading prices to our patrons. 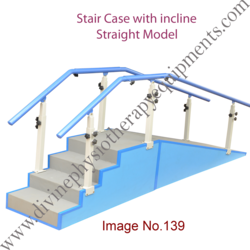 With a sole motto to provide excellent range of products, we are offering an exceptional quality of Stair Case for Physiotherapy to our esteemed clients. This is used in hospitals and nursing homes for physical therapy. It is well manufactured by utilizing optimum quality materials and ultra-modern techniques at our well equipped production division. Moreover, this can be purchased from us in different specifications at affordable price range.